This interactive web mapping application has been realised by Bettina Engels, Christian Sonntag, Atossa Pandazmapo, Franza Drechsel and Mirka Schäfer (Junior Research Group “Global Change – Local Conflicts?”(GLOCON), Freie Universität Berlin) to support the analysis of conflicts over mining in Burkina Faso. 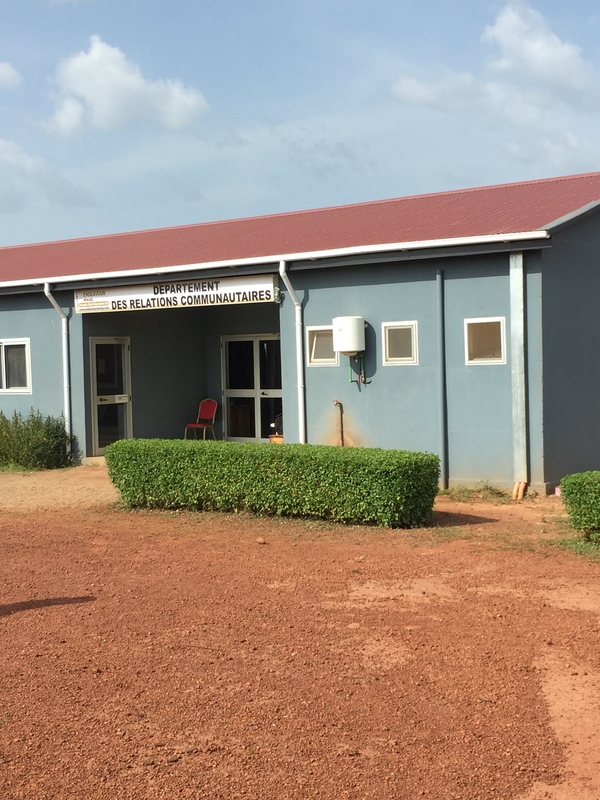 The project aims to integrate quantitative geo-data and data of qualitative social research to generate a better understanding of conflicts around mining in Burkina Faso. Diana Ayeh provide the text and photographs of the Yaramoko mine. Hermann Moussa Konkobo wrote the French text on the Houndé mine. Merle Groneweg, Sarah Kirst and Hermann Moussa Konkobo provided photographs. Many thanks for this! This web map has two sections: the map itself and more detailed text about the mines. (1) The legend of the map is found on the right side of the screen. In the upper part, you can switch between different base maps, that is, you can choose between a satellite image, open street map and a landscape map. In the bottom part, map layers can be selected depending on your focus. For more information on the mines click on the icons on the map. A small overview map of the broader area is on the left side of the screen. The search function and the geographic coordinates of the mouse position are at the bottom left. Zoom in and out of the map via the mouse wheel or by using the "+" or "-" sign in the top left area of the map section. (2) On the top of the screen, you find written information and photos on the conflicts of some of the mines under the tab “Mining and conflicts”. The information is based on our own research. Due to limited capacities, not all conflicts and mines are present in the same depth. Direction Générale de la Géologie et du Cadastre Minier (2013), Permis de recherche octoyés au Burkina Faso, in: ITIE (2014), Rapport de conciliation des paiements des sociétés minières à l’état et des recettes perçues par l’état des dites sociétés pour l’exercice 2012. 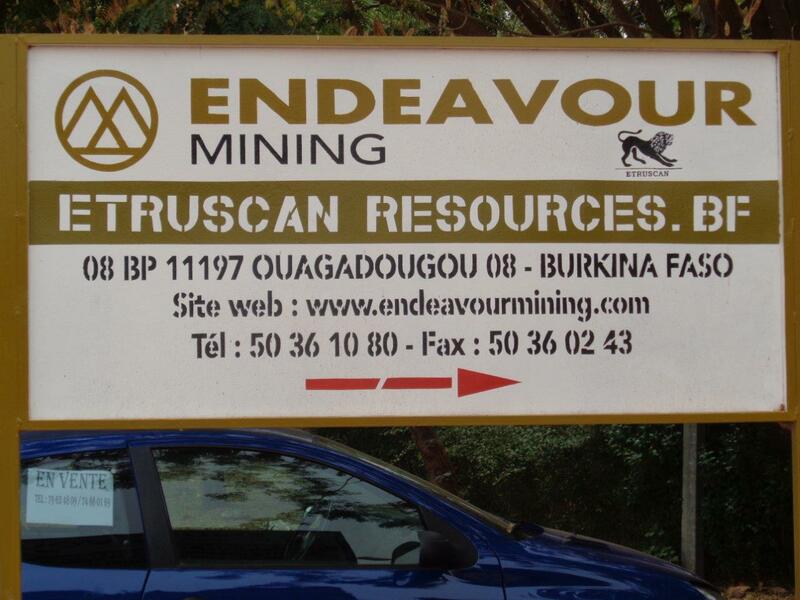 Ouagadougou: Initiative pour la Transparence dans les Industries Extractives (ITIE), p. 25. Bureau de recherches géologiques et minières (BRGM) (France), Bureau des mines et de la géologie (BUMIGEB) (Burkina) (2003): Carte géologique et minière du Burkina Faso à 1:1.000.000. Orléans. City Population (2017): Population of cities in Burkina Faso. Burkina Faso is Africa's fifth gold producer (after South Africa, Tanzania, Ghana, and Mali). In 2018, 52.66 tons of gold were produced in Burkina Faso, according to the minister of mines. This represents an increase of more than 15 per cent as compared to 2017 (45.8 tons). Artisanal mining has a long tradition in Burkina Faso, while large-scale industrial mining is relatively new and currently expanding. In December 2018, 11 industrial mines were active, including 10 gold and one zinc mine. At the same time, exploration is strongly pursued; in March 2014, there were exploration and exploitation licenses for more than 40 per cent of Burkina Faso's overall surface (Harris & Miller 2015: 15-17). In 2018, more than 700 exploration licences exist, including 99 that have been granted in March 2018 (OCDE 2018). The Burkinabé land rights stipulate that all land belongs to the state. This also includes natural resources. The first regulation of legal mining titles and a law on investment were passed in 1993. The review of this regulation fed into the first mining law, the code minier in 1997. It stipulated the liberalisation of the mining sector, a consequence of the economic measures of the structural adjustment program. The state was no longer the most direct and important investor in the mining sector; private economic mining activities were permitted and encouraged. In 2003, yet another mining code was introduced with a 20% corporate tax for the mining industry, which is comparably low and was thought to attract foreign investors. Currently (2018), the corporate tax is set at 28% (for details on mining taxes in Burkina Faso, see Dorin 2017 ). The most recent code minier was ratified in 2015, against the backdrop of first experiences of producing mines, and mines that have closed down. It is now in the process of being implemented. Contrary to the former mining laws, the new code minier is rather oriented toward state revenues through mining, especially via a newly introduced Mining Fund for Local Development (FMDL). The new legislation will, however, not lead to a substantial change of the mining politics and its impacts (Hubert 2018). The introduction of the 2015 mining code, and particularly of the FMDL, was a result of long civil society campaigns for a more just distribution of the state revenues generated from the industrial mines. In the current process of implementation, mining companies use all possible means to bypass the new code, e.g. by stating that their mining conventions, or contracts, stemmed from periods of old mining codes and thus the new one did not apply to them. Civil society organisations therefore continuously demand the due implementation of the 2015 mining code. Civil society organisations therefore continuously demand the due implementation of the 2015 mining code: In October 2018, several civil society organisations (ORCADE, Publiez ce que vous payez, Oxfam) published a report in which they call for the realisation of the mining law in terms of the environment, the local supply, the national job security in the mining industry and the implementation of the FMDL by the mining companies (Nabole 2018, ORCADE 2018). In Burkina Faso, most people in rural areas live of subsistence agriculture as well as livestock farming. Another important source of income is artisanal gold mining, which in French speaking West Africa is subsumed under the term orpaillage, the French word for gold washing (i.e. artisanal gold extraction in water courses). Despite its origins, however, the term also encompasses people, referred to as orpailleurs, who extract gold by digging holes in the ground. These pits are often 20 to 50 metres deep, and according to interviewees can sometimes reach up to 100 metres. The orpailleurs use ropes to descend into the pits and work with rudimentary tools to extract potentially gold-bearing ore. In a multi-stage process, the ore is ground by motor-driven mills or by hand, then washed and sieved through cloth. The separation of the gold from the ore is finally achieved using mercury and sometimes cyanide (for a detailed explanation, see Tschakert/Singha 2007). There are considerable differences between industrial and artisanal mining with regard to the amounts extracted, the number of people employed and the number of extraction sites. In 2016, 1,359 kilo-ounces (koz) of fine gold were mined in Burkina Faso. According to these statistics (DGMGC 2017), only 7.2 koz came from artisanal mines though the actual amount may be significantly higher, as artisanal gold mining largely takes place informally: estimations vary between 9.5 and 30 tons per year (AN 2016; INSD 2017; OCDE 2018). 500-700 artisanal mining sites are officially counted in the country; it is estimated, however, that more than 1,000 exist (AN 2016, OCDE 2018). In 2017, in total 9,651 persons were directly employed in the currently 11 industrial mines, including 9,017 Burkinabé and 634 people of other nationalities (Kaboré 2018). The vast majority of employees from Burkina Faso work in low qualified and badly paid positions. In contrast, more than one million people live on artisanal mining in Burkina Faso (Chouli 2014: 29; Guéniat & White 2015). 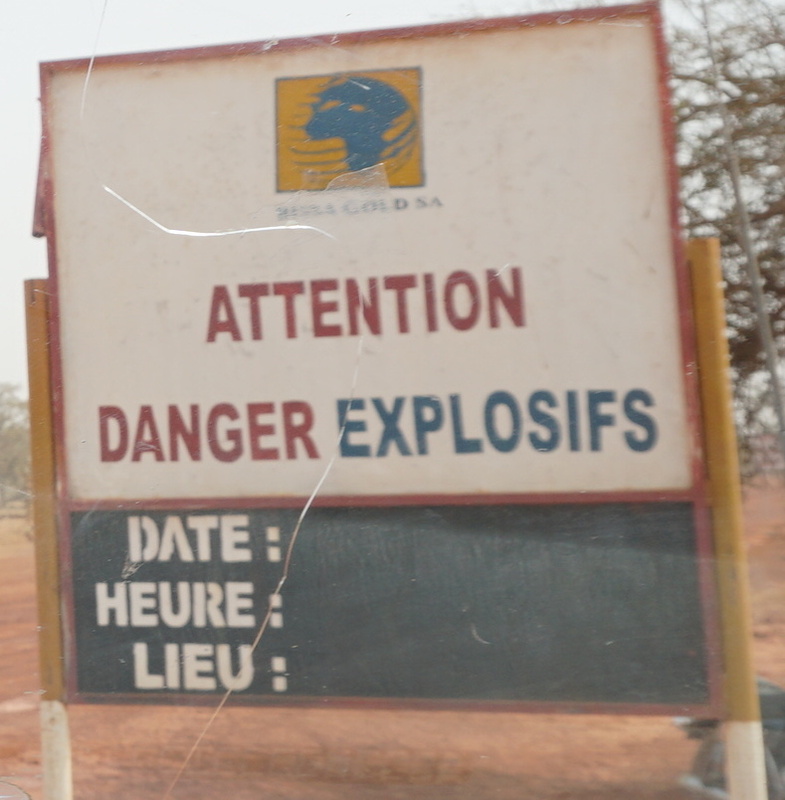 The opening of industrial mines in Burkina Faso has sparked conflicts in the nearby villages. There are various reasons why the people living close to the mines protest. Broadly spoken, the implementation of large-scale mines creates conflicts over land and its use. A new mine is installed on land that has previously been used for farming or for orpaillage, land where people have been living on or where holy sites have been located. The mining companies' promise to create formal employment cannot compensate for the losses the people experience. When land is taken away for the mine, subsistence agricultural or livestock farming is no longer possible. As compensation, only rarely are new fields given to the affected families. The operators usually ban orpaillage on the mining concession, which takes away another important source of income. Affected people often perceive that their concerns regarding the protection of holy sites or other needs are treated disrespectfully by the company management. This adds to the general discontent. Our map visualizes these conflicts. Chouli, Lila (2014): Le boom minier au Burkina Faso: Témoignages de victimes de l’exploitation minière. Paris. DGMGC (2017): La production minière. Direction Générale des Mines, des la Géologie et des Carrières. Ouagadougou. Guéniat, Marc & White, Natasha (2015): Golden Racket. The True Source of Switzerland s Togolese Gold. A Berne Declaration Investigation.Lausanne/Zürich. Hubert, Nicolas (2018): La nouvelle législation minière burkinabée : quels risques en matière de développement durable? In: Canadian Journal of Development Studies / Revue canadienne d'études du développement, 1-15. ORCADE (2018): Etat des Lieux de la Mise en Oeuvre du Nouveau Code Minier du Burkina Faso: Organisation pour le Renforcement des Capacités de Développement/Publiez Ce Que Vous Payez/Oxfam. 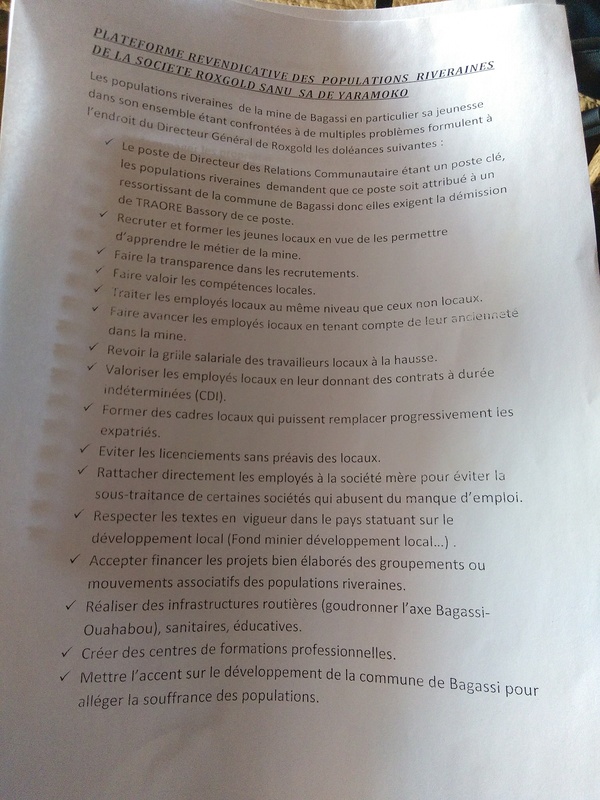 In this section, some useful documents are listed that are related to mining and conflict in Burkina Faso. Brot für Alle, Fastenopfer (2016): Profit wichtiger als Menschenrechte? Gold aus Burkina Faso und die Verantwortung der Schweiz. Luzern. Diabate, B. (2016): Mine Houndé Gold - Les populations peuvent-elles espérer?, in MBDHP (eds. ), Liberté. Bulletin d'Information du Mouvement burkinabè des droits des l'homme et des peuples, p. 24-25. Diabate, B. (2016): Mine Houndé Gold Operation. Déjà des fausses promesses, in ODJ (eds. ), Le Combat des Jeunes. 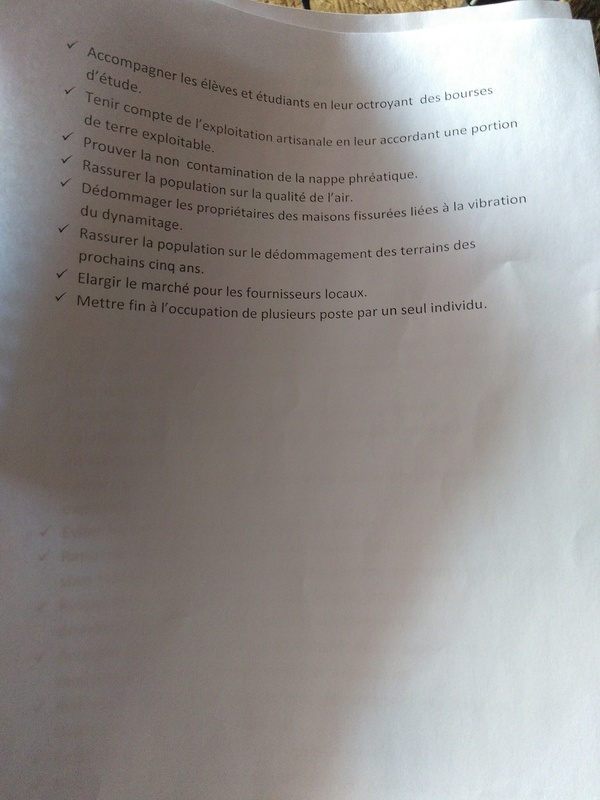 Organe d'information et de formation de l'Organisation Démocratique de la Jeunesse du Burkina Faso, p. 8. MBDHP (2015): Les victimes des droits humains commises dans l'exploitation minière. Cas de Namissiguima et de Perkouan, in MBDHP(ed. ), Droits Humains au Burkina Faso. Rapport 2015, p. 48-53. Drechsel, F. & Groneweg, M. (2018): Les mines nous appauvrissent. Impact de l'extraction aurifière industrielle au Burkina Faso et reponses de la société civile, Ressources Naturelles, 3, Rosa Luxemburg Stiftung Afrique de l'Ouest. Chouli, L. (2014): Le boom minier au Burkina Faso: Témoignages de victimes de l’exploitation minière, Paris: Fondation Gabriel Péri. Côte, M. and Korf, B. (2018): Extractive Enclaves, Entangled Capitalism and Regulative Pluralism at the Gold Mining Frontier in Burkina Faso. World Development, 101, p. 466-476. Drechsel, F., Engels, B., Schäfer, M. (2018): “The mines make us poor”: Large-scale mining in Burkina Faso GLOCON Country Report, No. 2, Berlin : GLOCON. Engels, B. (2018): Nothing will be as before: Shifting political opportunity structures in protests against gold mining in Burkina Faso. The Extractive Industries and Society, 5: 2, p. 354-362. Gueye, D. (2001): Small-scale mining in Burkina Faso. Mining, Minerals and Sustainable Development. Mining, Minerals and Sustainable Development (MMSD), 73. Lanzano, C. (2018): Gold digging and the politics of time: Changing timescapes of artisanal mining in West Africa.The Extractive Industries and Society, 5: 2, p. 253-259. Luning, S. (2008): Liberalisation of the Gold Mining Sector in Burkina Faso. Review of African Political Economy, 117, p. 387-401. Luning, S. (2012): Processing Promises of Gold: A Minefield of Company-Community Relations in Burkina Faso. Africa Today, 58, 3, p. 22-39. Luning, S. (2014): The future of artisanal miners from a large-scale perspective: From valued pathfinders to disposable illegals? Futures, 62, A, p. 67-74. Werthmann, K. (2003): The President of the gold diggers: Sources of power in a gold mine in Burkina Faso. Ethnos Journal of Anthropology, 68, 1, p. 95-111. Werthmann, K. (2009): Working in a boom-town: Female perspectives on gold-mining in Burkina Faso, in: Resources Policy. Resources Policy, 34, p. 18-23. Werthmann, K. (2012): Gold Mining in Burkina Faso since the 1980s, in: Werthmann, K. & T. Grätz (eds. ): Mining Frontiers in Africa. Cologne, p. 119-132. Sako, A., Bamba, O. & A. Gordio (2016): Hydrogeochemical processes controlling groundwater quality around Bomboré gold mineralized zone, Central Burkina Faso. Journal of Geochemical Exploration, 170, p. 58-71. In February and April 2018, youth demonstrate demanding employment in the mine (Mairie de Houndé 2018; RadioOmega FM 2018). The mayor promises to support their claims and to negotiate with the operator; an outcome is still pending. Fitzgibbon, Will/Bama, Yacouba Ladji (2017): Paradise Papers. West African development dreams stand still while mining money moves offshore, The Irish Times. Fitzgibbon, Will/Bama, Yacouba Ladji (2017): Glencore en RDC et au Burkina. Ce que révèlent les Paradise Papers, Jeune Afrique. This collection of useful links is not exhaustive but a possibility for further research. In April 2018, eleven industrial mines were active, including ten gold and one zinc mine. Nine more exploitation permits have been granted and production at these sites will start in the next years (AN 2016a: 4f.) These will mainly be gold mines, however, other minerals such as copper or manganese were also found. Contrary to the map, the list below includes the projects with exploitation permits where construction has not yet started. In this section, the conflicts around six mines are summarised. Due to limited capacities, not all conflicts are presented in the same depth. Hence, some accounts are more detailed than others; sometimes a small photo gallery is included. For more information, just click on the name of each mine. A seperation wall between the houses of the newly constructed Bouly village. Ongoing conflicts around the mine of Bissa-Bouly revolve around the issues of employment, relocation, compensation payments but also pollution leading to an increase in respiratory illnesses. The affected population feels that the installation of the mine has not brought any improvements to their living conditions, but rather the opposite. Protests that have begun in spring 2016 relate to the end of the five year time frame for compensation. The mining company compensated with cash families who had lost their home or their fields for a period of five years. The affected population understood that after five years, further compensation payments would be made. The company, however, has expressed no intentions in that regard. The fact that families who lost their fields to the mine were not compensated with another field but rather in cash diverges even from The World Bank's (World Bank 2013) recommendation for compensation. It was supposed that these families would be able to develop other income generating possibilities with the money they got. However, without much education and training, this has proved difficult. The lack of income generating activities also means that those who sell goods at the local markets are affected by the local population's diminished purchasing power: “I had 75,000 FCFA (ca. 115€) per year selling cereals, beans, groundnuts... This is no longer the case”, states a woman from the village of Bissa. Another group within the affected communities used to live from artisanal mining, or orpaillage, before the mine was constructed. Since this activity has been prohibited on mining concession lands, this group lost an important source of income. “I worked as an orpailleur and I earned about 200,000 F CFA (ca. 310€) per year. Today, this is no longer the case, as the mine has occupied all gold sites where we worked”, explains a woman from the village of Imiougou. Another woman adds: “I sold food at the [artisanal] mining sites, but with the arrival of the mine, I stopped this and am not doing anything now”. The village communities around the Bissa-Bouly mine demand employment for their people as a form of compensation for their loss of income sources. However, only about 40 per cent of the mine's employees are from the surrounding villages, and they engage in mostly low skilled and poorly paid labour. Though the mine management has promised to increase the local employment numbers, little seems to change. Yet another source of conflict is the relocation of the villages around Bouly, due to the recent extension of the Bissa mine. The new mining site, which started production in 2016, is located a few kilometres away from Bissa. In February 2017, most of the people due to be relocated were unsatisfied with the houses that were offered as compensation and hence many refused to move. Others feel they now live too close to the mining site and are affected by dynamite blasts that damage their houses. They demand to be relocated, though their demands are rejected by the company which views their houses as being situated at a sufficient distance from the mine. The increased traffic of lorries carrying heavy loads on unpaved roads has led to an increase in air pollution, and subsequently respiratory disorders. As there is no health clinic nearby, protesters demand both the tackling of pollution and the installation of a medical treatment centre. Above all, the local populations have the impression that the mine management is unapproachable. Many have the feeling that they cannot properly address their complaints to mine officials – and even when this is done, they see no change. This increases the discontent, and as a way of expressing it, the local population has engaged in frequent protests, demonstrations and uprisings since the construction of the mine sites, as a way of presenting their claims and petitions to the mining company and local state authorities. Civil society organisations have repeatedly published statements, called press conferences and engaged in meetings with the local authorities and representatives of the mining company to enforce the villagers’ claims. At a number of times, residents gathered and marched spontaneously to express their anger. In the municipality of Sabcé, women took to the streets at several occasions. On 18-19 April 2016, a group of women occupied a stretch of the principal road in the municipality to enforce their claim for employment for the local youth, compensation for farmers, and for investment in the community’s infrastructure. With their protests, the women urged the mining company and the local authorities to some concessions such as the construction of a women’s social centre and the liberation of four youth activists from the village of Imiougou who were arrested during protests against the mine on 15-16 June 2016. Due to the women’s protests the arrested activists were liberated a few days later. In early July 2016, youth from four villages of the municipality (Goungla, Imiougou, Zandkom, and Guibaré) occupied areas where they previously had been mining gold artisanally and that are now part of the Bissa mine’s concession area. The youth complained that though the five-year period of compensation had expired, the mine continued producing and neither renewed indemnity nor kept its promises regarding investment in local infrastructure. The youth thus reclaimed the land. The security forces stopped the protests and 25 young men were arrested. Three of them were liberated after four days; 22 remained in custody for several weeks, being accused of theft on the mine's concession area. The Burkinabé Movement for Human and People’s Rights (Mouvement Burkinabè des Droits de l’Homme et de Peuple, MBDHP) provided them with a lawyer. He achieved that the court proceeding passed quickly. 20 defendants were given four month probation, the remaining two eight month. As he points out, the surrounding population is dissatisfied with the situation following the installation of the Essakane gold mine. Artisanal gold mining is no longer possible, the fields offered as compensation are not as fertile as the old ones and there are not enough employment possibilities at the mine for nearby villagers. In the local trader’s point of view, those who profit are not – as was promised – the people living near to the mine, but the “leaders”. Apart from banning artisanal gold mining, the industrial mine of Essakane also took over most of the fertile lands for agricultural and livestock farming. Even though the World Bank standard for compensation suggests that the fields given as compensation need to be of equal or superior quality to those taken (World Bank 2013), many families now have problems to survive off their own produce (Brot für Alle, Fastenopfer 2016). A local small farmer states: “Before the mine, we lived better, we had animals, we were rich”. The lack of income generating activities renders the surrounding population more dependent on employment in the mine. However, in the view of the local population, not enough people from the surrounding villages are directly employed by the mine or profit from indirect jobs as suppliers. On the contrary, dismissals of local workers led to increased anger amongst the affected population. For more information on environmental effects of gold mining in Essakane, cf. Porgo, M. & Gokyay, O. (2017): Environmental impacts of gold mining in Essakane site of Burkina Faso. Human and Ecological Risk Assessment: An International Journal, 23, 3, p. 641-654. 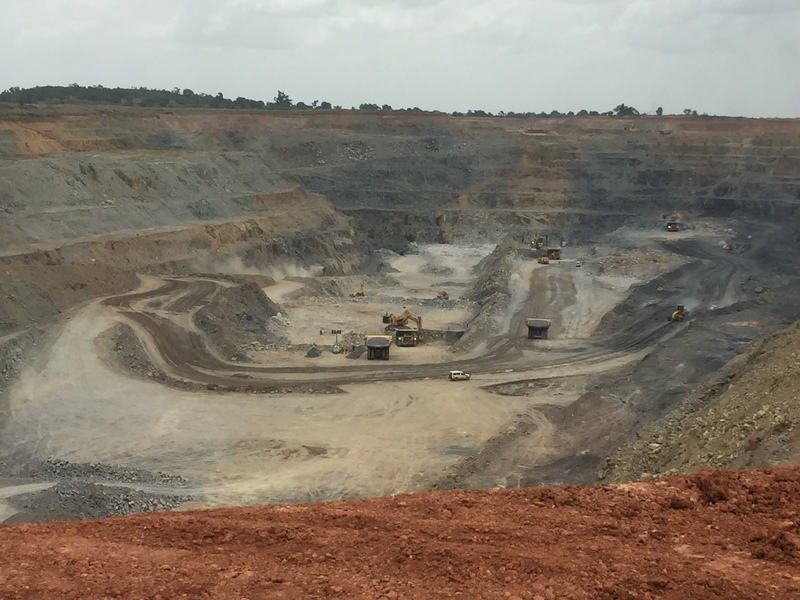 After the production stop in 2017 the former owner Avocet mining sold the Inata gold mine in 2018 to the Indian company Balaji Group which is based in Ghana. Until now the workers of the mine have not been paid their wages since 2017 nor did they receive fair compensations or retirement and medical benefits according to national law. A few hundred of the approximately one thousand affected workers have formed the "Collectif des ex-employés de la Société des mines de Bélahouro (SMB)" to demand their rights. In total they claim an estimated amount of 12 billion Franc CFA of wages and benefits. The communities living close to the mine of Karma are very dissatisfied with its installation, among others, because of an important mosque close to the mining permit. When their concerns were not heard either by the authorities or by the mine management, they protested. The repression that followed only increased the population’s discontent, which still lasts. Another source of anger is the lack of income generating possibilities due to fields lost to the mine and little employment in the mine itself. In 2015, populations in and surrounding the district of Namissiguima protested during the construction phase of the Karma mine due to fears that the gold mining activities might destroy the important mosque of Ramatoulaye, a site of pilgrimage. Hence, already before construction started, local people and religious authorities expressed their concerns about how the dangerous blasts used in mining processes could affect the mosque. However, they were not taken seriously by the mining company or government authorities, and the installation went ahead as planned. This sparked anger and led to protests in January 2015 demanding the burial of the mining project, during which parts of the mine were set on fire. Due to the strong determination of the government of Burkina Faso, the Sheikh of the Ramatoulaye Mosque, the Minister of Mines and the Director General of Riverstone Karma SA signed an agreement in June 2015. Thus, the construction continued and eventually, the production started in April 2016. Since the installation of the mine, affected people have been complaining that living conditions deteriorated. Families lost the fields on which they cultivated crops that used to feed them for the whole year. Trees that had existed for over one hundred years and whose leaves and flowers had been used for medicine were felled. The population from the surrounding villages criticises that contrary to the promises made, very few are employed in the mine. Before its installation, many lived from artisanal gold mining, an activity that they can no longer follow as it has been prohibited by the company. According to informants, also more than 200 women used to generate own funds in orpaillage, which is no longer possible. A former orpailleur from Namissiguima states: “The loss of employment linked to orpaillage has destroyed the economy of the village, leading to poverty.” A colleague of his adds: “Everything has become more difficult in the village. Until now, I have not yet paid the tuition fees of my children, something which had never happened to me before.” These problems are not only caused by the ban on orpaillage, but also by the lack of land for agriculture and the lack of alternative income generating possibilities. The village of Boulouga is supposed to be resettled to the benefit of an expansion of the mine. Conflict emerges about the resettlement plans in general and the planned location in particular. The village’s traditional chiefs proposed a possible area (the “zone 3”, locally called Brininga) for resettlement, but this was rejected by the local authorities and the mining management. Instead, the mining company decided that the village should be resettled to “zone 5”, a part of the village of Kiswendé. The population of Boulouga refuses to move there, as this location is considerably less attractive with regard to economic, social, and cultural conditions. To avoid a resettlement to this area a group of people under the leadership of the local chiefs has decided to move to “zone 3” at their own expenses. Moreover, people demanded to be compensated for their loss of agricultural land with 400,000 Franc CFA (ca. 600€) per hectare every year as long as the mine lasts. These claims have been equally rejected by the mining company and local authorities. 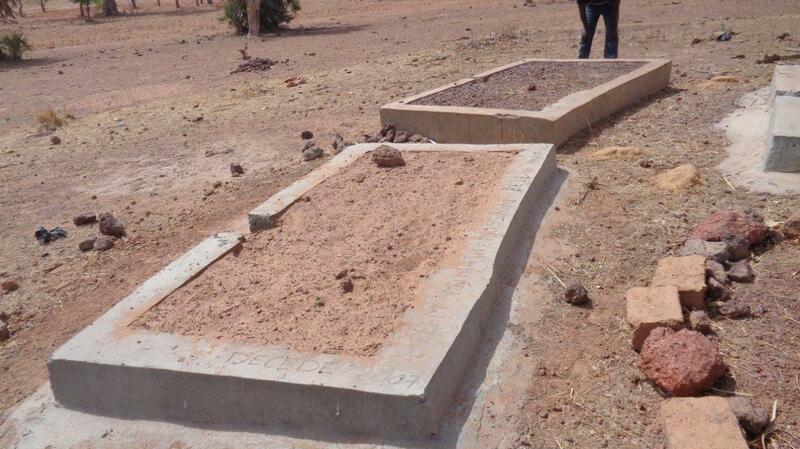 Another current conflict evolved around the cemetery of Boulouga since the mining company wants to defile the tombs or relocate the mortal remains. According to informants, in the beginning the mining company adopted the proposal of the population to build a fence around the cemetery but now it is trying to influence the inhabitants to give in and accept the relocation or destruction of their cemetery. As a result, conflicts over who could claim being “autochthon” to the village emerged. 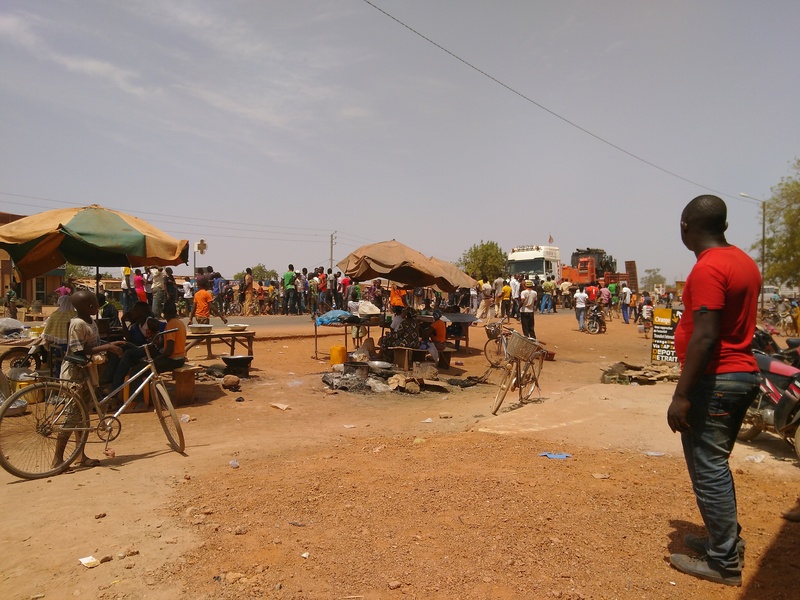 As a way to raise their claims inhabitants of Boulouga organised village assemblies, wrote letters to the local and provincial authorities, and addressed allies in the capital Ouagadougou to present the demands to the national authorities. Close to the zinc mine of Perkoa, local people found their living conditions to have deteriorated since the mine’s installation. Fertile fields were taken away, leaving the nearby population in poverty since other income generating options are rare. A woman from the village complains: “This mine has made us very poor in this village. The area of the mine was the granary of the village and above all the basket of the housekeeper. We no longer have access to all that nature had given us”. The promises made by the mine management were not held. The attached Nantou Foundation was responsible for the various projects that the mine management wanted to undertake, such as road and school construction. However, the foundation used the money allocated by the mining company for private purposes. Thus neither a health clinic nor the promised infrastructure was built. Furthermore, jobs for locals in the mine remain rare, even though employment is the hope of many, as a job is seen as the only way out of their difficult situation. As one woman from Perkoa summarises: “The company occupied our land but does not take care of us”. As a result of local people’s discontent, in mid-2015, protesters blocked the access road to the mine, halting production for some days. They demanded the realisation of the company’s promises, as well as employment. The roadblock was also a way of expressing anger over ongoing corruption within the Nantou Foundation. When the mine management warned that the mine would have to close if the protest went on, government authorities ordered the dispersal of the roadblock. However, the brutal interference of special security forces incited fury among those who were protesting peacefully for their basic needs. A small farmer from Perkoa states: “The mine has sabotaged us; it promised not to tramp on our backs and today it tramples on our heads. The mine lacks respect for our village when arresting and imprisoning our youth”. Fualdes, Par Nelly (2017): Glencore en RDC et au Burkina. Ce que révèlent les Paradise Papers, Jeune Afrique. The Taparko Gold Mine, close to the Taparko village, was the first industrial mine that started production in Burkina Faso after Poura, a gold mine that was closed in 1999. When the owning company Nordgold from Russia signed the contract with the government of Burkina Faso in 1995, the country had no mining code. Nordgold was granted a stabilization clause stating that it will pay a stable license fee equal to 3% of the value of gold sold during the contract period of 25 years. The company still benefits from this agreement from the past, saving 16 million US Dollar since 2011 compared to other mining companies which pay 4-5% ( J.B. 2018). Since construction work has started in 2005, conflicts between the mining company and the surrounding population have been recurring. The establishment of the mine resulted in several problems for the village: Many local farmers have lost their fields and therefore their income; hopes for recruitment have not been fulfilled; residents feel endangered by the blasts at the site, and they suffer from health and environmental damage caused by the gold mine. Currently, the extension of the mine implies the resettlement of 1,100 people (Nordgold 2017) and it remains to be seen how the population reacts. In the beginning, the people of Taparko hoped that the gold mine would provide training and jobs, especially for the youth. Soon they realised that quite the opposite was the case: Workers were mostly recruited from outside the village. Furthermore, the mining concession comprised farming land. As most of the Taparko villagers are peasants, they depend on their land. Losing their fields hence meant losing their source of income. According to interviews, some children even had to leave school to help generate an income for their families after their parents could no longer farm. Revenues have not only been lost from farming but also from artisanal mining, which has been prohibited on the concession area. Against all hopes, the gold mine of Taparko has thus failed to offer job possibilities in the view of the villagers and instead has worsened the living conditions of the people. With the mining site being close to the village of Taparko, the population feels threatened. The work of the mine includes dynamite blasts in order to crush the gold containing rock. These provoke ground motion and take dust and rocks into the village. People report that one day a child even got hit on the head by a projectile. Furthermore, villagers suffer increasingly of respiratory illnesses, caused by the dust related to the gold extraction. The detonations are not only a risk to the people but they also cause damage to their houses and produce a lot of noise. Stock farmers complain that their animals are no longer safe with the gold mine being in the direct neighborhood. The local population feels that the mining company does not care about them and officials seem unapproachable. Many people have the feeling of being exploited. The villagers wish for an open dialogue with the company and a peaceful relationship as neighbours. While some of the people call for the government’s mediation to help building such a relationship, others feel that the government and the mining company are working together. They thus call for protection by the government instead of supporting the interests of the company. Since the population of Taparko has the impression that the mining company does not care about their problems, the villagers use different forms of protest like road blockades (see video), strikes and demonstrations to underline their demands. After years of conflict and protest many residents of Taparko feel frustrated. One farmer even asks: “What can the poor do against all this? Nothing”. All in all, the people of Taparko have the feeling that the gold mine is taking almost everything from them without giving anything back. A female student points out how left out the villagers feel by saying: “Everyone talks about the mine of Taparko but not about the people of Taparko”. The locals wish for a share of the profits in form of investments in local infrastructure (roads, school, hospital, drinking water and the construction of houses in distance to the mining site), job opportunities and in general support for the development of Taparko, since “if it is good for us [the locals] it is also good for them [the mining company]. But only to come for the money and not to think about us is not good” (local farmer). 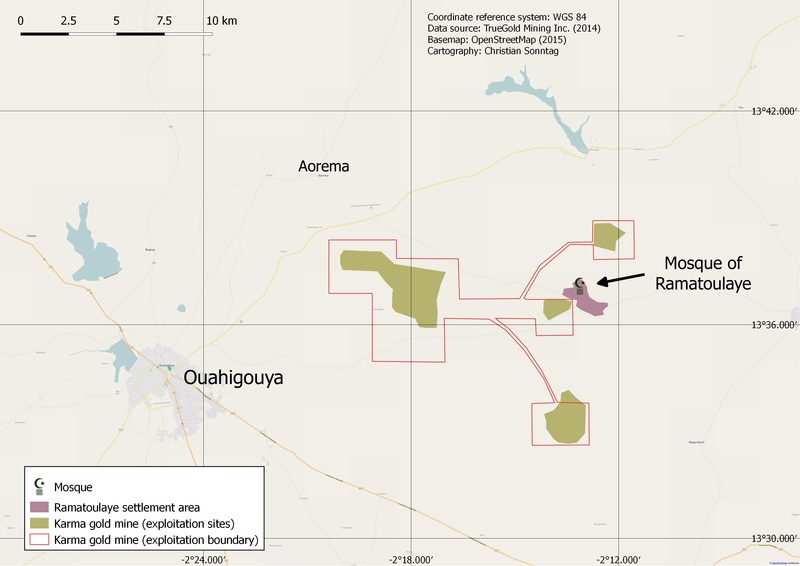 The Yaramoko Gold Mine, located in in the Houndé greenstone belt region in the Province of Balé in southwestern Burkina Faso, is the first and to date only underground mine in the country. It started commercial production in October 2016. 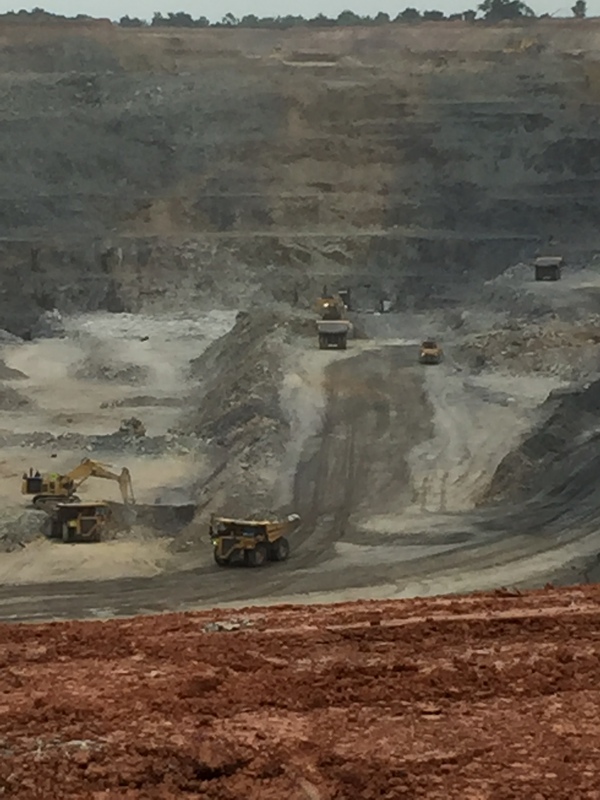 The Canadian based company Roxgold and its Australian subcontractor Africa Underground Services (AUMS) are currently extracting and developing two gold deposits: the “55 Zone”, a fully underground mine which is presently in production and “Bagassi South” which is expected to achieve commercial production by the end of December 2018. After the approval of the extension project by the Burkinabè council of ministers in June 2018, the concession was extended from the initial 15,84 km² to 23,54 km² in total. The company expects to have a 40% increase in annual production due to Bagassi South. Because of the extension project, many local farmers have lost their fields. Nevertheless, those most affected by the mine extension are people whose livelihoods have been directly or indirectly dependent on artisanal and small-scale mining. Artisanal and Small-scale Mining (ASM) evolved as an important livelihood strategy for local people in the late 1990s. During the 1990s and early 2000s, Bagassi saw an influx of artisanal miners who had mainly been migrating from the northern parts of the country. In contrast to their elders, the native youth of Bagassi soon got involved in these activities. Despite the prevailing harsh working conditions, artisanal mining acquired a reputation for being an alternative, necessary and rapid income generating activity. As a result, many inhabitants of Bagassi have been involved in commercial activities in and around artisanal mining camps. Due to the official opening of the Yaramoko mine in October 2016, artisanal miners had to leave the “55 zone”, many of them moving to “Bagassi South” which evolved as a proper village and important commercial and living space due to ASM practices. With the extension of the mining concession in April 2018, the last important remaining area of artisanal mining in Bagassi disappeared. Many inhabitants of Bagassi, and especially young people, lost access to the land that has been fundamental for their economic survival. Landowners, farmers and some artisanal miners were compensated for their loss of land and the corresponding livelihoods in 2016 and 2018 respectively. To date many landowners and farmers complain about the slight amount of financial compensation (approximately 350,000 CFA franc per ha and year), and primarily about the duration of compensation payments. While commercial gold production is expected to take place for at least 10 years, compensation for the loss of land is only provided for a five-year period. Young people are, if it all, only secondary beneficiaries during negotiation processes for compensation. The negotiations usually only take place between the affected landowners and farmers, and the mining companies. Younger people often have no other choice than to accept the conditions of compensation and resettlement negotiated by their family heads. A young protester in Bagassi articulated it thus: “They [the mine executives] have been discussing with our old parents, our voices have not been heard […] they are only working with the landowners.” Yet, young people are particularly affected by lack of job opportunities, and are usually the one´s engaged in artisanal mining, in contrast to their elders. In October 2018, Roxgold and its subcontractors provided employment for 900 persons with 49% of employees from the immediate area. However, artisanal mining in the past has largely outnumbered amounts of staff necessary for the highly specialized underground mining activities. Despite Roxgold´s efforts in capacity building and training of local workforce, all executive positions at the mine site are concentrated in the hands of expatriates, mainly from Canada, Australia and other African countries. They rarely leave the concession site, and thus are not spending much money in Bagassi´s local economy. Consequently, the indirect benefits for the local community are perceived as less significant, when compared to artisanal mining. Local procurement and engagement of suppliers from the immediate area is seen as insufficient and for the benefit of a few individuals. In order to recruit staff locally, the company relies on a local committee of village elders (conseils villageois de développement) who select potential candidates for “non-qualified” positions or as daily laborers, according to the needs of the company. A local “youth movement” has recently accused the committee of non-transparency and corruption. 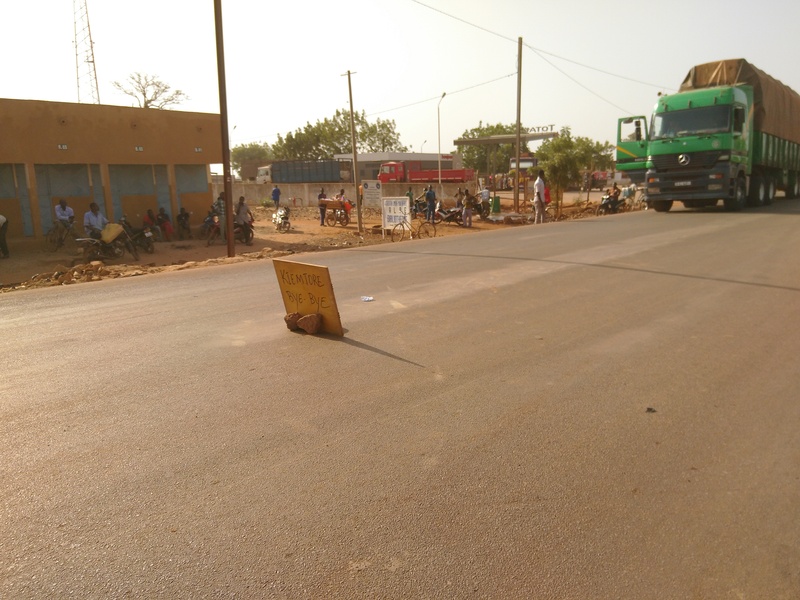 Only two days after Roxgold received the “2018 Best Corporate Responsibility Award” at the West Africa´s Mining Activities Week (SAMAO) in Ouagadougou on September 28, 2018, young protesters who were unsatisfied with the company’s concession extension since April 2018, erected a roadblock in front of the mine´s entrance in Bagassi. As the company’s directors had not met their demands, another roadblock was set in place for the early morning of October 9, 2018. The company responded to the disturbance by sending the national police forces (CRS) in to dissolve the gathering, which they did using teargas and physical violence. The young demonstrators then resorted to more radical means of protest; they destroyed the houses and facilities of members of the local authorities involved in the recruitment of “local staff” for the mine, accusing them of corruption and mismanagement. The main target of contestation was the company and its more senior staff. The young protesters requested the resignation of the community relations officer at the mining site and demanded more employment facilities for local youth. They further demanded better working conditions for day laborers and other local staff. One main topic of contention was the central place artisanal gold mining still has for their livelihoods strategies. Since the only remaining artisanal mining site had been dissolved due to the Bagassi South development, they made demands for the approval of an alternative site on the exploration concession of Roxgold, where they could continue with artisanal gold mining activities (see photos of the written claims in their “plateforme revendicative”). In total, the Roxgold exploration concession extends to an area of 230 km² in the Balé province. Media news on demonstration against the mining operator Roxgold and the repression of the protest in October 2018. In the eyes of the people of the nearby village, the operator Burkina Mining Company is not living up to its promises. Be it work for the community, the construction of wells, or other needs of the population, the mine has disappointed those whose hopes were once high. The village lacks access to electricity, even though it is located next to the fully electrified mine. This lack of electricity reinforces the lack of possible income generating activities. The young generation feels marginalised by the mine as well as by the local government authorities and thus sees no other option than to stand up for themselves to demand jobs and other support necessary to lead a decent life. The CCJ calls public meetings and press conferences and meets up with state authorities at the national and local level and with the mining company to raise its claims. In its recent memorandum (CCJ 2018), it joins forces with the labour union of mine workers (Syndicat des Travailleurs de la Géologie, des Mines et Hydrocarbure, SYNTRAGMIH). During marches organised by the allicance (e.g. on 24 February 2017), protestors have faced repression by state security forces. On 23 March 2018, local youth spontaneously blocked the principal road leading to the town and the mine. On 17 April 2018, youth marched to claim that the mining company should hire those who have participated in the professional training it has provided. The state security forces stopped the march and arrested five demonstrators (ODJ 2018). ODJ 2018: Déclaration: La Sous-section ODJ de Houndé condamne la répression contre les jeunes de la commune et exige la libération des 5 jeunes arrêtés le 17 avril 2018 par les forces de l’ordre, Houndé, 18 April 2018, Organisation Démocratique de la Jeunesse du Burkina Faso. In 2002, gold was discovered in the area around the village of Pousgin, and villagers started artisanal mining, or orpaillage. According to local informants, since 2002, up to 3,000 people at the same time were living and working on the site. Informal artisanal mining at the Pousgin site provided a major base of livelihood for people of the surrounding villages. The unlicensed artisanal mining site was closed in 2014 in favour of the exploration works for West African Resources' Sanbrado project (previously Tanlouka Project). Shortly afterwards, then President Blaise Compaoré was driven out of office. In response, those artisanal miners who had worked on Pousgin before its closure, came back to work on it again. However, they were expelled by special security forces, la Compagnie Républicaine de Sécurité (CRS). According to local people, many artisanal miners who lived and worked on the site lost more or less everything. They say that the market was arbitrarily burnt down, bicycles and motorbikes destroyed, etc. (LeFaso 2016). The anger of the people from nearby villages is particularly directed against Pierre Tapsoba, the national director of the Sanbrado Project, who had been a high ranking politician under the Blaise Compaoré regime (SC-Info w.y.). They demand the immediate closure of the mine as well as the compensation of all those who had losses in 2014. As one achievement of their protest, villagers have been granted an area for artisanal mining. However, according to local artisanal miners, the area is less productive, compared to the previous one. According to local residents, they were told that six villages shall be relocated for the construction of the industrial mine. Though numerous houses have already been marked by a painted white cross that they shall be resettled, no resettlement plan has been presented. If anything, residents have been offered a lump sum and not – as is the usual procedure – a new house. Local informants clearly state that they are not willing to leave the village, as they have been born there and their ancestors have been buried there. Due to the conflicting interests, regular consultations take place between the different parties. The mayor sides with the company, hoping that the industrial mine strengthens economic development in the community (AIB 2017). Usually, the participation of common villagers lacks in local consultation frameworks; it thus seems unlikely, that the demands of the former artisanal miners are taken into account.